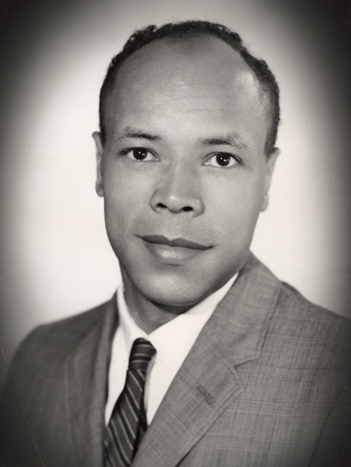 Meredith Gourdine, a physicist and engineer, was an inventor with dozens of patents dealing with gas dispersion and conversion. He was also a star athlete who won a silver medal in the long jump in the 1952 Olympics in Helsinki, Finland. Gourdine was born in Newark, New Jersey, and raised in Brooklyn, New York. His father, a laborer, advised him to stay in school so he would have better opportunities in life. After graduation from Booklyn Tech High School, Gourdine turned down an athletic scholarship (for swimming) from the University of Michigan and chose to attend Cornell University. At Cornell, he earned the nickname “Flash” as an intercollegiate track champion, competing in sprints, low hurdles, and long jumps. He received a B.S. in engineering from Cornell in 1952, the same year he won his Olympic medal. He served as an officer in the U.S. Navy and then did graduate work in engineering at the California Institute of Technology, supported by a Guggenheim fellowship. He worked as a senior research scientist at the Caltech Jet Propulsion Laboratory for two years and was awarded his doctorate in 1960. In 1964, after working in private industry, Gourdine founded his own research and development firm, Gourdine Systems, in Livingston, NJ. In 1973, he founded another company, Energy Innovations, in Houston, TX. Energy Innovations produced direct-energy conversion devices from his patented designs. The devices converted low-grade coal to high-voltage electrical energy. A pioneer in the field of electrogas dynamics, Gourdine invented an engineering technique known as Incineraid to disperse smoke from buildings; it was later adapted to disperse fog from airports. Another of his inventions, Focus Flow Heat Sink, was used to cool computer chips. He married twice, with three daughters from his first marriage and a son from his second. In his later years, he suffered from diabetes and lost his sight and a leg from effects of the disease, but he continued to work as an inventor and as chief executive of Energy Innovations until his death in 1998.